ESA’s CryoSat and the Copernicus Sentinel-1 missions have been used to measure subtle changes in the elevation and flow of ice shelves that, in turn, reveals how huge canyons are forming underneath. Warm bottom ocean water is entering the cavity under Antarctica’s Dotson ice shelf and is stirred by Earth’s rotation. This is causing one side of the ice shelf to melt. The canyon, which has formed over 25 years, is now 200 m deep in places and the ice just above it is heavily crevassed, affecting the shelf’s future ability to buttress the ice on land. We are all aware that Antarctica’s ice shelves are thinning, but recently scientists have also discovered huge canyons cutting through the underbelly of these shelves, potentially making them even more fragile. Thanks to the CryoSat and Sentinel-1 missions, new light is being shed on this hidden world. Antarctica is surrounded by ice shelves, which are thick bands of ice that extend from the ice sheet and float on the coastal waters. They play an important role in buttressing the ice sheet on land, effectively slowing the sheet’s flow as it creeps seaward. The ice sheet that covers Antarctica is, by its very nature, dynamic and constantly on the move. Recently, however, there has been a worrying number of reports about its floating shelves thinning and even collapsing, allowing the grounded ice inland to flow faster to the ocean and add to sea-level rise. 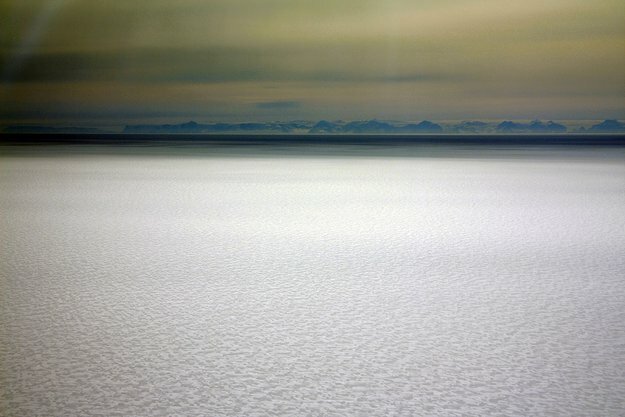 While scientists continue to study the changing face of Antarctica, monitor cracks in the surface of the ice that might signal the demise of a shelf and learn how these changes are affecting the biology of coastal waters, they are also aware of dramatic changes taking place below the surface, hidden from view. There are huge inverted canyons in the underside of ice shelves, but little is known about how they form and how they affect the stability of the ice sheet. One type is thought to be caused by subglacial water that drains from beneath the ice sheet and runs into the ocean. In this region, the ocean water is stratified, with the warmer water at the bottom. However, as the colder meltwater pours down into the ocean it then rises because it is less dense than the seawater – but as it rises it drags up the warm bottom water which causes the underbelly of the floating ice shelf to melt. Another type is thought to be caused by the way ocean water circulates under the shelf. Scientists have been using ESA’s CryoSat to study changes in the surface of the ice shelf and the Copernicus Sentinel-1 mission to study how shelves flow to learn more about what’s going on hidden from view. 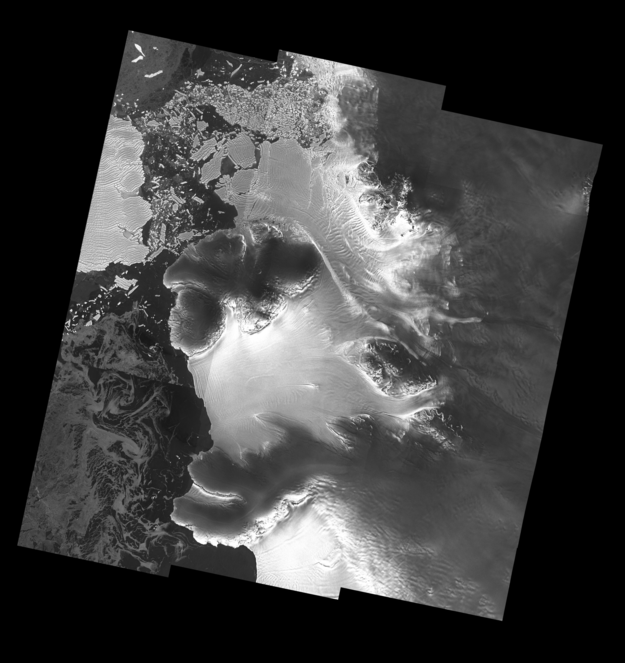 Their focus has been on the Dotson ice shelf in West Antarctica. Noel Gourmelen from the University of Edinburgh said “We have found subtle changes in both surface elevation data from CryoSat and ice velocity from Sentinel-1 which shows that melting is not uniform, but has centred on a 5 km-wide channel that runs 60 km along the underside of the shelf. “Unlike most recent observations, we think that the channel under Dotson is eroded by warm water, about 1°C, as it circulates under the shelf, stirred clockwise and upward by Earth’s rotation. “Revisiting older satellite data, we think that this melt pattern has been taking place for at least the entire 25 years that Earth observation satellites have been recording changes in Antarctica. “Over time, the melt has calved in a broad channel-like feature up to 200 m deep and 15 km across that runs the entire length of the underside of Dotson ice shelf. “We can see that this canyon is deepening by about 7 m a year and that the ice above is heavily crevassed. 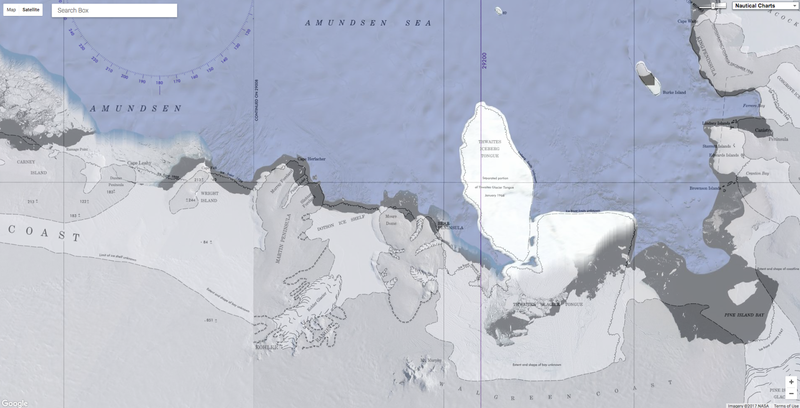 A figure showing Dotson Ice Shelf and the Amundsen Sea Sector of West Antarctica. Colors show ice flow of grounded ice across the grounding line (white line) feeding floating ice shelves (DIS and Crosson Ice Shelf (CIS)), as well as ocean regions of high annual primary productivity (APP) (Arrigo et al., 2015). “Melt from Dotson ice shelf results in 40 billion tonnes of freshwater being poured into the Southern Ocean every year, and this canyon alone is responsible for the release of four billion tonnes – a significant proportion. ”The strength of an ice shelf depends on how thick it is. Since shelves are already suffering from thinning, these deepening canyons mean that fractures are likely to develop and the grounded ice upstream will flow faster than would be the case otherwise. “It is the first time that we’ve been able to see this process in the making and we will now expand our area of interest to the shelves all around Antarctica to see how they are responding. We couldn’t do this without CryoSat and the European Commission’s Copernicus Sentinel missions,” added Dr Gourmelen.